In the early 1980s, Jeff Koons captured the public’s attention with his displays of banal, everyday objects. 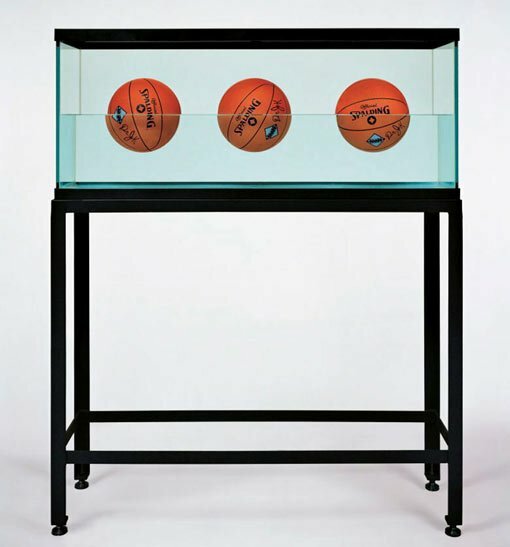 The simple appearance of Three ball 50/50 tank belies its symbolism: the artist considers the basketballs as surrogates for the self. Initially suspended in equilibrium, they will eventually move and decay, reminding us of the impermanent nature of happiness, stability and, ultimately, life. Koons deliberately references a sport often used by urban, working-class youths as a path for upward social mobility. His parallel message is that the middle classes use art in much the same way. This work also appears in the adult audio guide, available for rent, and in the children’s labels. This work is part of the series Equilibrium , in which Koons sought to address notions of happiness, stability and life. Research other works in this series. How do they reference these ideas? What is the role of the readymade in this series? Appropriation plays a significant role in art of the 1980s. Artist Philip Brophy reflected at this time ‘not all so-called “image scavangers” operate along strict lines of theft: some embrace their images, some are seduced by them, some analyse them, some prevent them.’ How is this quote relevant to the way Koons approaches artmaking? Andy Warhol greatly influenced the artists of the 1980s. What elements of Warhol’s art practice can be seen in the artmaking of this time? Are there Warhol references in Three ball 50/50 tank? Is there an artist who particularly influences your own work? Create a body of work that specifically reflects their influence, and discuss how that influence is evident in the work. At the end of the 1970s, a new generation of artists revitalised pop art’s strategy of referencing and borrowing from popular and consumer culture. They lived in a world now saturated with images and could relate to pop’s critique of originality and authenticity. In 1982, the art historian and critic Paul Taylor curated the exhibition Popism at the National Gallery of Victoria, which profiled the rise of a post-pop sensibility in Australia. It included work by Juan Davila, Jenny Watson and Imants Tillers, among others. The ‘popists’ were deeply engaged with the way images are used, manipulated and spread through mass reproduction, yet painting remained a key means of expression. In New York and elsewhere, artists such as Cindy Sherman and Richard Prince were exploring these issues using photography. They approached the seductive and alienating effects of mass media images with notable irony. Others referenced street culture (Keith Haring) and suburbanism (Howard Arkley). These practices owed a significant debt to Andy Warhol and in a gesture of homage, Taylor lifted the term ‘popism’ from the title of Warhol’s 1980 memoir about the sixties. Some artists also acknowledged this legacy by citing Warhol’s work or the history of pop art more broadly.